Workshop title: Creativity in the teaching of Chinese: Developing learning games and fun classroom activities. If you are interested in fun, creative and enhanced positive learning, this workshop is for you. This workshop will introduce a variety of classroom activities (based on the four learning skills). These will be tried and tested activities, particularly aimed at Key Stage 3. The activities will include a mixture of games, animation, internet, music and videos. 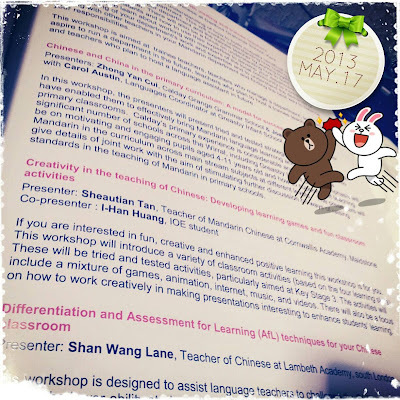 There will also be a focus on how to work creatively in making presentations interesting to enhance students' learning. Click ME to download the presentation of the workshop. Note: Explanation of each game/activity has been written on each slide note. From now on, I'm going to talk about how I feel about giving a workshop yesterday. Today is the 10th Annual Chinese conference in the UK, which was organised by the IOE Confucius Institute for Schools; IOE 孔子学院. Both me and I-Han (the best co-presenter ever!) were very pleased to have a chance to give workshop in the conference for other teachers from all over the UK. One of the teachers asked "When are you two going to start the talk? Its 10 minutes late now." We were panic, but we then decided to make a start while waiting someone to fix the projector. After 15min, finally the projector was fixed and our talk went much better. (Powerpoint, we love you) The audiences showed a really really great interest in our workshop! After that, lots of teachers came to us giving us very positive feedback. They loved it, they enjoyed it, they learnt lots of things from our workshop! Thank you for the IOE for giving us such as great opportunity. Thank you for all teachers who came to our workshop to support us. "It was a wonderful presentation!" "Your activities are so creative. I am going to use them in my French/Spanish lesson!" "Your lessons must be great fun! Lots of interesting activities and games. I am gonna steal some of them and use it in my lessons. Haha." "Your teaching resources are so beautiful. You must have used lots of time on them! Amazing!" "I-Han, I am very looking forward to work with you next year. These great activities are exactly what we need in our school!" Head of MFL of I-Han's new school said. "Long time no see, Tian! You have changed so much. It was really a great presentation. Well done! Can I have your contact details please? Lets keep in touch!" "Thank you so much for being so generous in sharing all your great ideas and resources. They are amazing!" "How long have you been teaching your school? "/"About 1 year."/"Really?! But from your teaching resources and ideas, you look like you have been teaching for many years! Wow!" "When I first saw the programme schedule, I quickly made a mark on your workshop. I tell myself I definitely come to your workshop! And I think I made the right choice!" After the first workshop, both of us were exhausted. We were supposed to have our lunch after that, but we kept thinking about what had happened earlier on. Lots of people... Projector didn't work... Trying to share as many ideas as possible. Anyway, our second workshop was another success too! Great presentation, I learnt a lot! It was so nice to see you in preson at the 2nd workshop. Thank you for giving us so many ideas and willing to share. I can't believe that you are NQT, you are doing so well!